This doesn’t look as attractive on the plate as I was hoping for. We had some trouble getting the skin on the mackerel to crisp up for some reason, perhaps we over-crowded the pan. While we presented it on a plate, we actually ended up flaking the fish onto some jasmine rice and mixing in the sauce. That would have looked even less pretty though so I suppose I should be grateful that we have this picture. I’ve been craving mackerel this week, most likely because there’s been so much focus on sustainable fish in the media lately (you can read more about it here). We had a surfeit of Thai-style vegetables left over from earlier in the week and this recipe from “Thai Traditional Cooking – The Mother’s Recipes” seemed perfect. It specified whole, white fish but there was definitely enough punch in the chilli sauce for a stronger tasting fish like mackerel. It wasn’t as quick as the prawn dish we cooked on Tuesday but it didn’t take a lot longer. It had that perfect balance of hot, sour, salty, sweetness that Thai food is known for and kept us full all evening. £2.75 for those four mackerel fillets so easy on the wallet too. A good January dish. Start by cooking the mackerel fillets in some oil. We used a Jamie Oliver method that we saw on TV recently: fry the fish skin side down until the flesh on top has almost cooked through. Turn, cook briefly and then remove from the heat. While the fish is cooking, pound the chillies, garlic and shallots together in a mortar and pestle until you have a rough paste. Heat the tamarind juice, sugar and water together until boiling. Add the pounded ingedients and cook for two minutes. Add the fish sauce and then pour over the cooked fish. Dress with the spring onion and serve with jasmine rice and some vegetables. Adapted from “Thai Traditional Cooking – The Mother’s Recipes” by Maria Kanignan Saunders. Neither of us know where this book came from and the only online reference I can find for it is on Amazon, listed at £35. It’s a good book but it’s very small and probably not worth that much. The orginial recipe called for 10 small, red chillies which I thought sounded too much so I halved it. This was about the right kind of heat for us but it could have taken a little more so increase if you like extreme heat. There was no water in the original recipe either but there didn’t seem to be enough liquid from just the tamarind so we added that in too. Subscribe to comments with RSS	or TrackBack to 'Pla Rad Prig (Fried Fish with Chilli Sauce)'. Whether or not it looks good, it sure as hell sounds good. I think it looks pretty good – it can be hard to make fish fillets beautiful, but with all that chilli sauce on top it looks like it would taste amazing! 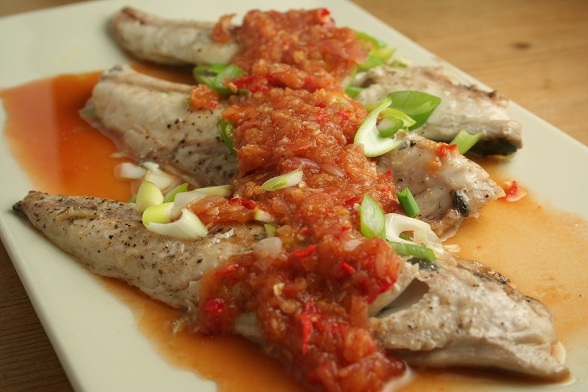 Looks good and the oiliness of the mackerel takes on hot and spicy flavours like a duck to water! Thanks everyone! This has been something of a favourite of mine in Thai restaurants over the years, so it was good to try it at home for the first time. The sauce turned out well, but the fish in restaurants is usually crispier than ours was – due to deep-frying I expect.